There are 7 regions: Kanto, Johto, Hoenn, Sinnoh, Unova, Kalos, and Alola. Currently Alola is the only region that has Trials. To see the available regions, type !r – that will also show how many locations you unlocked in the region. To fly to a different region, type !r [Region Number] – it will cost you 12,000 gold to fly to a different region, even if you already was there. Each region has about 60-91 locations, each location has different Pokemon spawns, a Gym, and sometimes a Trial. 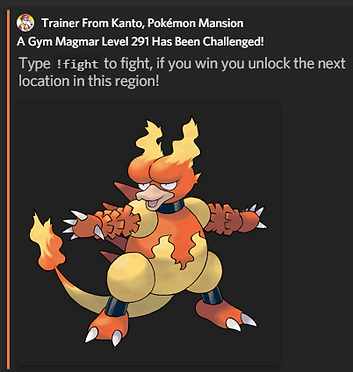 To unlock the next location in a region you have to beat the Gym in the last location that you unlocked, to spawn the Gym battle type !gym – then you can just battle the Pokemon like any wild Pokemon battle, if you beat the Gym Pokemon the next location unlocks. Type !location to see info on your current location such as Pokemon that spawn in the location and the Gym Pokemon. 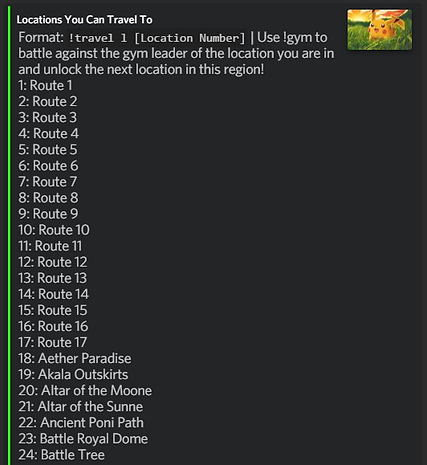 Type !l to see the locations you have unlocked, and type !l [Location Number] to travel to a different location in your region for no cost. That location must be unlocked by beating the Gym of the location before it. You can also type !l l to travel to the last unlocked location in the region.